President Donald Trump held another Keep America Great Rally last night at Landers Center Arena. He stuck it to Professor Blasey Ford, mocking her “I don’t remember” testimony against Brett Kavanaugh. Though the president mostly talked about Kavanaugh, he rallied in support of Senate candidate (R-MS) Cindy-Hyde Smith. 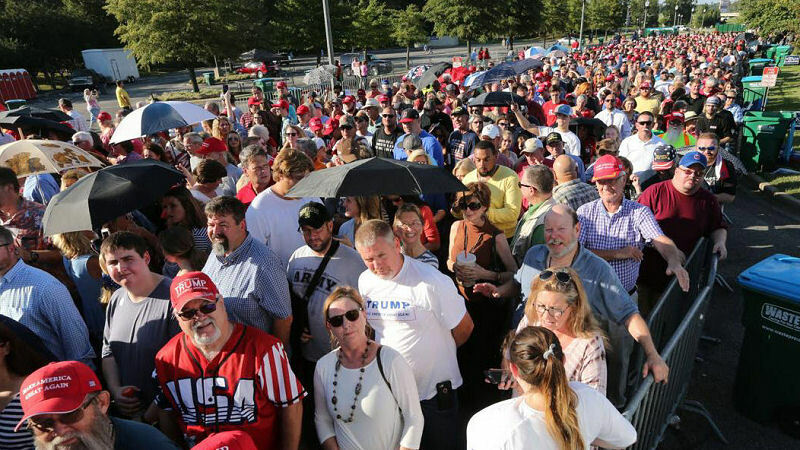 President Trump supporters wait in line to hear their president speak in Southaven MS Tuesday night. Despite the sweltering southern heat outside, Landers Center Arena was at full capacity. They’ve been trying to destroy Judge Kavanaugh since the very first second he was announced because they know he will follow the constitution as written. Another big message from the President was if you support him, then you must support the Republican ticket. I’ve got to say, 2020 is looking really good, President Trump said.